An administrator or Project Manager (if given the permission) can navigate to billing rate history of employees and make changes in Employee Rates as per the requirement. Billing history should be configured before entering timesheet record. Otherwise, time entry will not pick billing rate defined after recording time entry. In case if Administrator wants to modify time entry records which are already entered by other users, he can just add/edit billing rate record in history with the selection of checkbox [Update all records within time range]. It will update existing time entry records also with this newly updated billing rate in the specified date range. Billing Rates date range should not overlap with other rates in the same grid. This will result in wrong reporting and billing. Navigate to Employees (Link is on the top-left). Click the Options gear icon on the employee you want to access Billing Rates. Click on the Rate History option. Click + Add Billing Rate green button on the top right of the screen. Select the Billing Rate Currency, Employee Rate Currency, Billing Rate, Employee Rate, Start and end date of this rate. If there are some entries already exist of this employee and you want to update those entries with this rate, Click Update all records within this range and then Click Add Billing Rate Button. Click on the Options gear button against the billing rate you want to Edit and select Edit Billing Rate option. 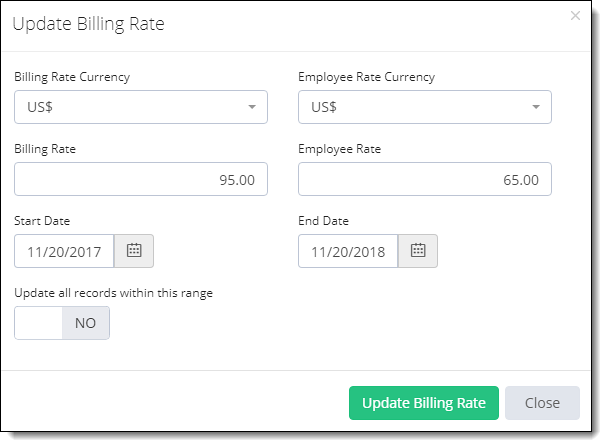 Make the changes in the required field(s) and if there are some entries already exist of this employee and you want to update those entries with this rate, Click Update all records within this range and then Click Update Billing Rate Button. Click on the Options gear button against the billing rate you want to delete and select Delete option. Click OK on the appeared popup for confirmation.